The Cultural History of Black Metal Theory and Philosophy – Extreme Metal Music as a ‘Schrödinger’s Cat of Culture’? 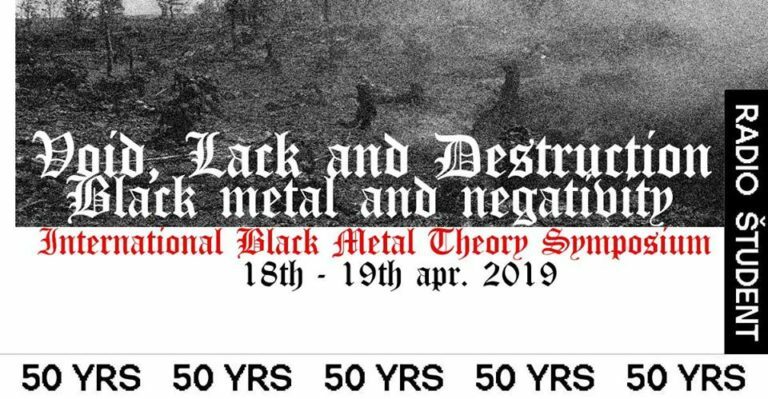 Since 2013, with the online and print journal ‘Helvete: A Journal of Black Metal Theory‘,1 there is an established or at least institutionalized discourse closely connected to Metal Music Studies, which dedicates itself to only theorizing Black Metal. Already earlier publications on Extreme Metal focused, at least partially, on Black Metal2 but with this journal (and its analogous blog and accompanying conferences)3 theorizing Black Metal (and thus putting it into the framework of theoretical science with its identitary and cultural traditions) gained a whole new level. For cultural history of heavy music, as practiced in this blog, this is of great interest. On the other hand, this trend of growing attention in the cultural mainstream, media and popular culture, means that Black Metal, as a distinct field of identitary and cutural practice of ‘subculture’, is transforming in it itself. It has to adapt its cultural concept to a new context, in which growing acceptance of its ‘being art’ becomes a threat to its self-fashioning; since its origins, it has emphasized rebellion, criticism of society, and, very often, nihilism, misanthropy or satanism. Now, this seems to be at stake. This current situation of Black Metal, gaining acceptance and at once having to adapt itself to a new cultural situation, is the historical crossroads which I want to reflect on in this post. Being at this crossroads, Black Metal discourse in 2016 is a fascinating subject of research. I claim that looking precisely at 2016 Black Metal (theory) at this crosscroads could make us to have to differentiate our concepts of ‘reality’ in Metal Music Studies. Like this, current Black Metal challenges our understanding of ‘reality’, our cultural philosophy of Wirklichkeit and réalité. We are facing a cultural current and strand of thought which has contradiction and paradoxicalities as its form of the production of coherence and meaning. Dealing with paradoxes and contradiction is as old as philosophy and science themselves.6 But in recent times, an own discourse of ‘Contradiction Studies’ emerged, most of all centered around the University of Bremen, Germany,7 which tries to deepen our understanding of contradiction in culture and cultural history. This is where my thought comes in: I put forward the hypothesis that, given the ambivalent situation of Black Metal in 2016, facing acceptance and struggling with its own tradition of being ‘anti-establishment’ at once, it is a form of culture that, currently, is able to perform a mechanism of the production of reality and meaning, in which both is possible – stressing authenticity and performing deconstructive nihilism. In fact, empirically both seem to condition each other in mid-2016 Black Metal. Thus, my point is that current Black Metal discourse could be seen as a ‘Schrödinger’s cat of culture’:8 being ‘dead’ and ‘alive’ at once, for Black Metal means to be capable of culturally being essentialist–constructive and ironic–de(con)structive at once, in the same space and at the same time. This is the result of the current situation of Black Metal – a challenging thought for the New Cultural History, which claims every form of culture to be only deconstructively available. This is seriously questioned – and actually, dealing with current cultural history of Black Metal philosophy, it maybe has to be questioned. Black Metal theory (to be seen as the currently most elaborated and institutionalized discourse adhering to the ‘black’ culture of its subject, and seeking linkages to traditional theoretical-philosophical science at once) is the discursive field, in which the mentioned processes of culture are negotiated: in the discourse of Black Metal theory, we find the present ‘battlefield’ where the cultural concept of Black Metal (comprising nihilism, rebellion, misanthropy, satanism, and many other ‘blackisms’) and the tradition of classic ‘Western’ and occidental scientific thought meet. Helvete is a new open-access electronic and print journal of black metal theory. Traditional Black Metal discourse generates reality by trying to deconstruct, often even destroying conventional forms of meaning. Its meaning was, up till it came to the crossroads examined, an ‘anti-meaning’. Its traditional mode of the production of meaning has been ironic-decontstructivist.19 Hence, to write a cultural history of the theory and philosophy of Black Metal in mid-2016, thinking of its current discursive tajectory, means to ask for the ongoing changes in the production of reality at this crossroads. A ‘Schrödinger’s Cat of Culture’? So, looking at this crossroads in Black Metal (theory) discourse in mid-2016, we see the crossing of two before separated paths of culture. It is a crossroads of discourse, of practice and theory, where constructivist imaginations and de(con)structive imaginations of realities give birth to a new and hybrid sphere of mutuality – its product, in terms of meaning and reality production, has to be a new form of a paradoxical métissage of constructive and deconstructive cultural text at once. This peculiar situation, a birth of a discourse, where construction and destruction of meaning is possible in the same place and at the same time, changes the axiomatics of the production of reality. In this discourse, which is the epitome of the overall cultural-historical situation of Black Metal and its philosophical core in mid-2016, both is possible: to adhere to the orthodox ethics of nihilism, satanism, misanthropy and like ‘blackisms’ of Black Metal subculture, in a deconstructive way; and, at once, to practice the philosophical constructivism of Enlightenment thought, constructively imagining human history of progress, emancipation and solidarty. The condition of discourse, which follows from this , is a very delicate one – it could be summarized in the metaphor of a ‘Schrödinger’s cat of culture’: in Erwin Schrödinger’s classic thought experiment from the year of 1935, summarizing the then knowledge on quantum mechanics, a cat could be dead and alive at once. This metaphor, in a nutshell, allegorizes the seemingly impossible contradiction which is inherent to the current situation of Black Metal culture, in terms of its discursive production of reality and meaning. It is characterized by a seemingly irrational and paradox discursive structure, which enables us to have constructive-idealist and de(con)structive-ironic imaginations of reality at once. This entry was posted in Artikel, Fachwissenschaftliche Artikel and tagged Black Metal, Black Metal theory, Cultural History, Philosophy, Schrödinger's cat. Bookmark the permalink.